Another lucky timeout. 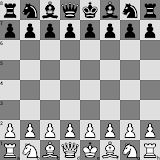 My current chess.com rating is based more on luck than skill. I was going to resign at one point, but Mrs Chessky felt that I needed to play to the end to be taught a lesson. Ha!